I’ve been hearing about Minecraft for at least a year now, but I just never got into it. Some part of me just doesn’t want to surrender the money needed to play a game that’s still in it’s alpha stages. I’ve played the free version, if you could call it playing. It’s less of a game and more of a strange Lego simulator. Apparently, in the actual game, you have to collect the resources necessary to make your blocks during the day, and survive a zombie onslaught during the night. At least, I think that’s what happens. The official website does a horrible job of explaining what Minecraft actually is. 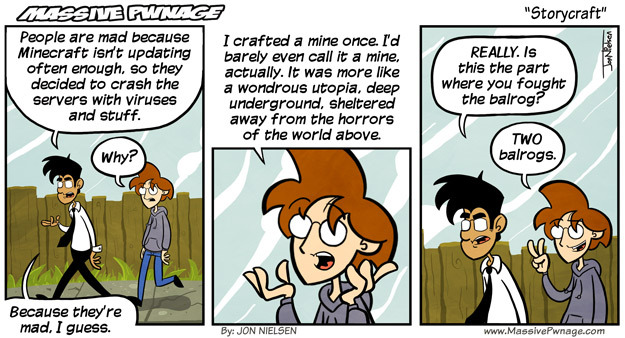 This entry was posted on Friday, October 22nd, 2010 at 12:00 am and is filed under Comics. You can follow any responses to this entry through the RSS 2.0 feed. Both comments and pings are currently closed. I played a… legitimately acquired copy of the game, and it’s basically what you said: collect materials during the day, hide at night. Well, until you create a decent defense. Although it does have its ‘somewhat’ addictive qualities, one can only mines for random stuffs with no real goal for so long. Well, you pay €9.95 now or €19.95 later. Early bird gets the worm. Either way, the game has a bit of charm once you find out that the new update will change gameplay to be even more challenging. With Alpha, the fun is to see how awesome you can make a fortress in it. And to keep at it until your island is a giant elablorate city. But the real fun will be when Multiplayer is sorted out. Hey, servers are back up.